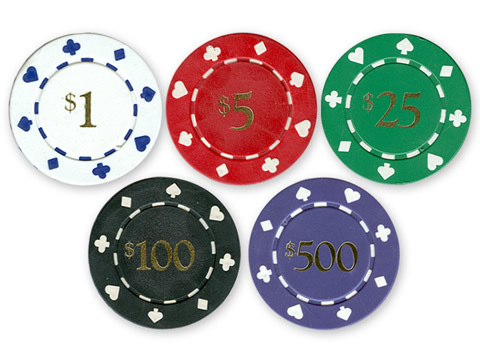 Other denominations of Card Suit Value Poker Chips are available on a special-order basis. Allow two to three weeks for special order denominations/colors. The minimum order is 25 Card Suits Value Poker Chips (you can mix and match chip denominations). Pre-Denominated Poker Chips with values ship within two business days of when you order. Need a recommendation on the quantity of each Value Poker Chip you should order? For a five to ten player game with a $1 minimum, we recommend 500 total Poker Chips with the following breakdown: 200 $1 White Chips, 100 $5 Red Chips, 100 $25 Green Chips, 75 $100 Black Chips, and 25 $100 Purple Chips. For Free Chip Samples and a Catalog, additional information, or wholesale pricing on Las Vegas Series Poker Chips, please contact us at 1-800-233-0828.